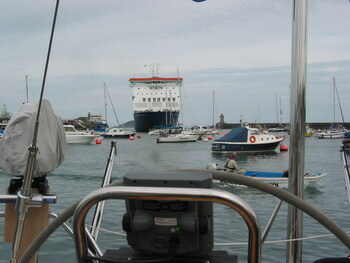 We left Cherbourg Saturday morning and had a pleasant day crossing the 46 miles to Guernsey, one of the Channel Islands. St. Peter Port was our destination. It is centrally located with many shops and restaurants nearby. 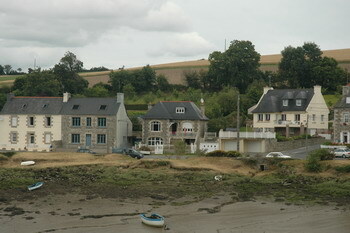 Colorful buildings lined the street across from the marina giving the area a French look. 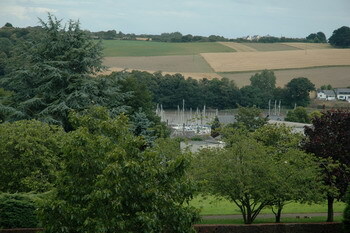 Once immersed in the city, the british accents and signs in english proved we were not in France, although very close. The only day we were not in France and we should have been as it was Bastille Day. Not perfect timing but we had to go with the weather. The night before, in Cherbourg, we were treated to a beautiful fireworks display happening very close to the marina. Sunny skies and calm seas ... all we needed was wind in the right direction for a perfect day. It wasn't bad though. We rafted up on a waiting pontoon in the outer harbor while we waited for enough water to clear the sill to enter the inner marina. 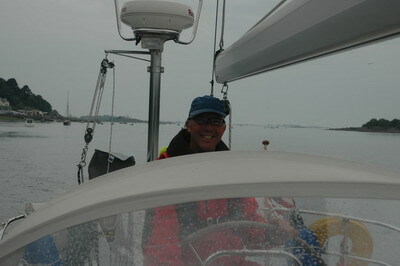 We passed the time with Sietse and Elma aboard Talmar. They introduced us to a tasty dutch drink for sailors. Too bad we didn't know about it when we were in Holland. 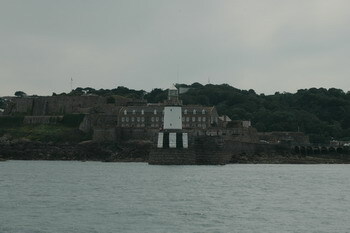 St Peter Port has been used for centuries. 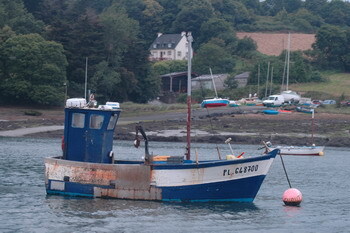 In 1984 they discovered a flat-bottomed Gallo-Roman vessel in the harbor entrance. It's cargo of tiles and pottery confirmed that it is the oldest wreck to be discovered in the British Islands. How did these islands, only a few miles off the coast of France become part of the British Isles? More confusing, why are they not part of the United Kingdom or the European Union? Somehow in 1066 the Duchy of Normandy gave them to England but then France took them back in 1204. Later they were given a choice of who should own them and they chose to be loyal to the British Crown. For being so nice, they were allowed to govern themselves and not pay taxes. That continues today with their own government and no VAT taxes. We should have waited to buy fuel here instead of in Cherbourg. 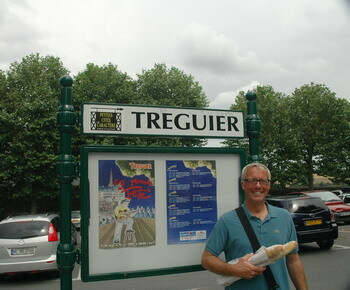 Our day traveling from Guernsey to Treguier, France was relaxing for nearly all the 59 miles. 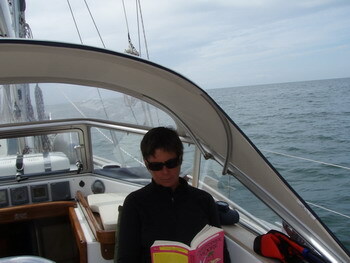 The seas were calm and we were able to sail until the winds dropped too low. Now we finally had wind from a good direction but not enough of it! 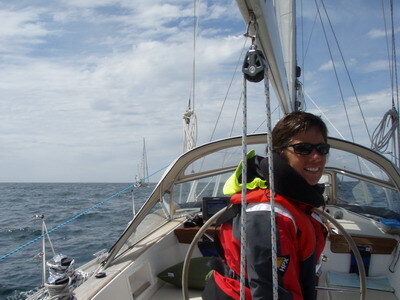 I'm beginning to wonder if sailing isn't just a wonderful dream that Jim and I have. We seem to be using our motor quite a lot. Anyway, the last 6 miles were up a river. The only other river we've sailed in was to Antwerp and it was full of container ships so this small river was no comparison. We arrived at low water which made us a little nervous. We were happy to be following Talmar as they have many more years of experience than we do. All went fine and we had a nice journey up the river flanked with rolling green hills, small farms and many little boats tied in the river and drying on the sand. This is Brittany. It is quiet, rural, green and pretty. The Pilot Guide says: "It is advisable to arrive and depart near slack water (we didn't, we arrived at the height of the tidal flow, i.e. the water was moving quickly) and use the visitors berths on the first two docks (they were full when we arrived) and do not attempt the inner berths except at slack water (well, that was our only choice ... with a good current). It turned out fine, Sietse and Elma helped secure lines and we ran plenty of lines to make sure we were secure when the tide turned. 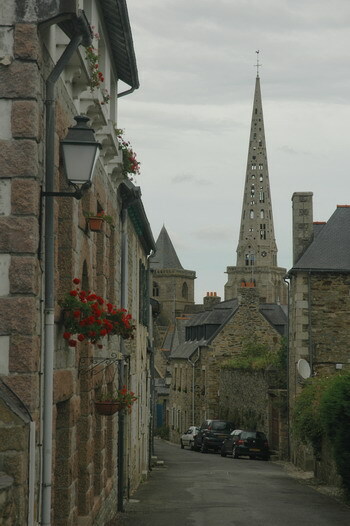 On Tuesday, July 17, we visited Paimpol by bus about 1/2 hour away. 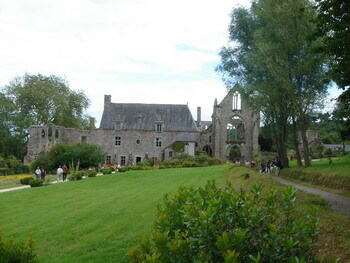 I'd read that there was an interesting abbey in Beauport, a short distance away, so we walked over to see it. 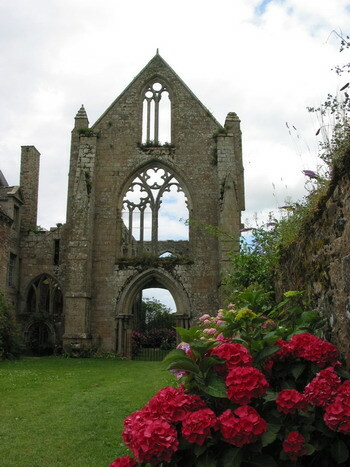 Built over 800 years ago, it is undergoing renovation but is still spectacular with a pretty garden of wildflowers. 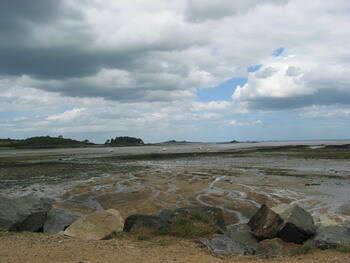 It lies right on the coastline surrounded by woods and marshes. We walked along the coast back to town and were treated to lovely sights of the coast. 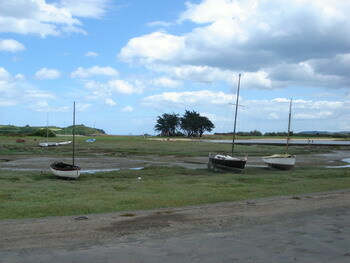 Since it was low water we saw many boats resting on the grass and mud. What a pretty sight with the marshes in the foreground, the sea and small islands in the background, small boats here and there, the deep blue sky and puffy white clouds. 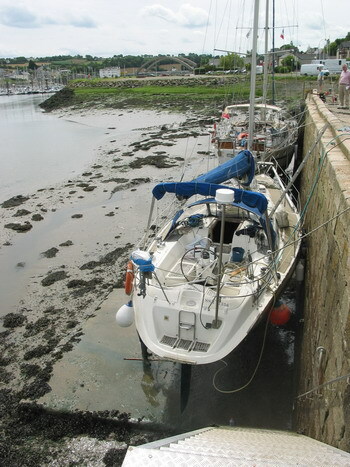 No wonder artists have painted seaside scenes in Brittany for centuries..
With the extreme tides it is easy to tie up to a quai and wait for the the tide to go out and then clean the bottom or do whatever repairs are needed. 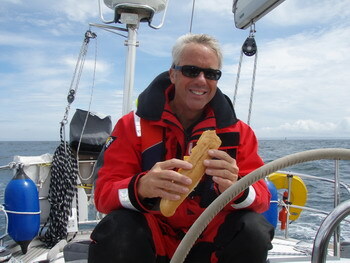 Jim enjoying a ham and cheese sandwich on a baguette en route to Guernsey. 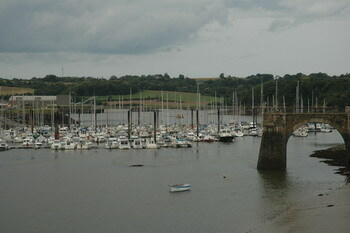 The entrance to St. Peter Port. A lighthouse and the 800 year old Castle Cornet greet yachtsmen on portside. 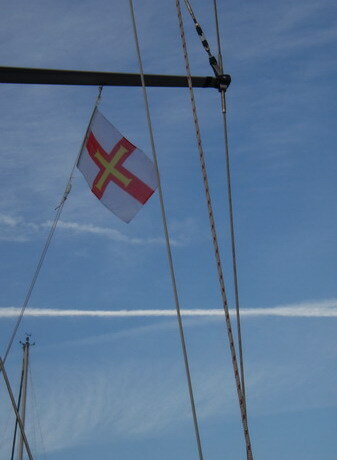 Tenaya flying the Guernsey courtesy flag. 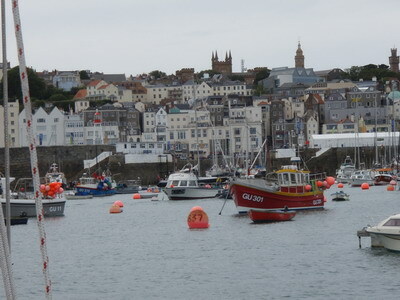 It was a small harbor in Guernsey. Soon after we arrived this huge ferry came in. 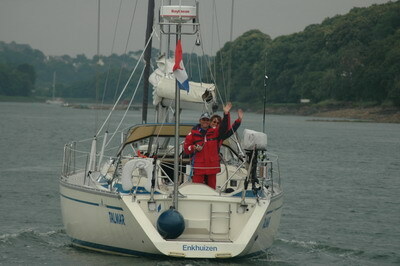 We met Sietse and Elma of TALMAR in Cherbourg. Their plans were similar to ours and we had both been held back by the bad weather. 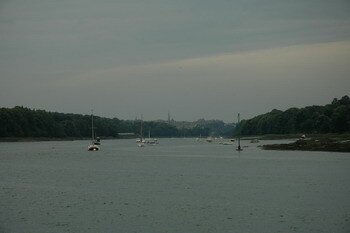 We decided to sail together to St. Peter Port and then to Treguier. 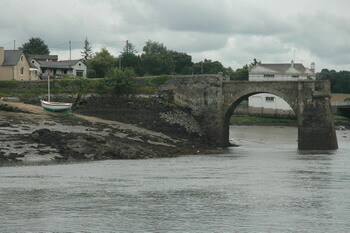 A small sailboat drying at low water and the remains of a bridge from long ago. This photo was taken from Tenaya's stern in the marina. The same boat floating at high water. The tidal ranges in the English Channel are up to 11 meters. 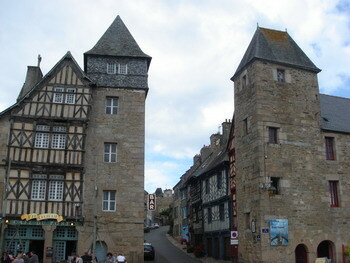 Much of Treguier is made of stone. Coming from California where nothing is built of stone, we found it quite nice. 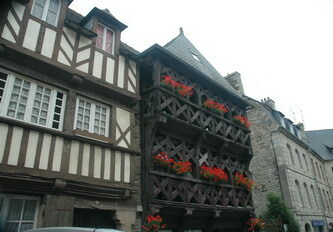 There were also many half-timbered buildings, some up to 400 years old. 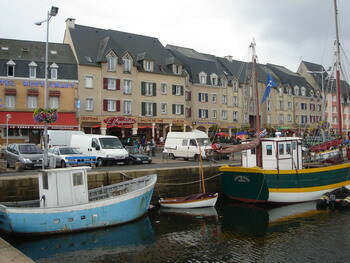 The marina at Paimpol was right in the city center. It would have been nice to come by boat instead of bus. The bus was much quicker though. 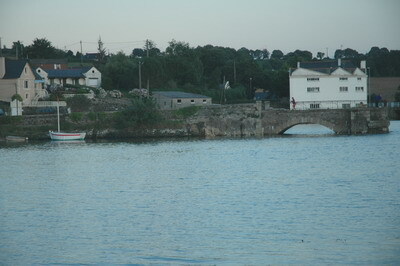 The marina in Treguier with one arch of the ancient bridge that was destroyed in WWII.